Transferred to the University Archives in 2000, 2003 and 2007. The collection is arranged alphabetically by subject. An addition to the collection that was processed in 2012 was divided into five series and arranged alphabetically within. The Trustees Council of Penn Women (TCPW) was established in 1987 to strengthen the University’s commitment to the advancement of women throughout the Penn community. Alvin V. Shoemaker, then chairman of the Trustees of the University of Pennsylvania, is generally credited with providing the institutional support necessary to assure the early success of the TCPW. In the years since its founding, the TCPW has enjoyed steady growth and accomplishment. By 2000 the TCPW had become a national network of Penn alumnae, numbering over 100 women, all of whom are distinguished in their chosen fields and share a deep interest in the well being of the University. The University’s Office of Alumni Relations has provided administrative support for the TCPW from its inception. The TCPW was initially organized into seven committees: membership, athletics, career planning, enriching the student experience, fund raising, institutional advancement for women, and sororities. The committee chairs, together with the TCPW chair, made up the Steering Committee, which, in late 1993, was re-named the Executive Committee. In the early 1990s, the committee structure was re-organized under six headings: Communications, Fundraising, Institutional Advancement, Leadership, Programming, and Student Life/Career Development. The activities of the Council’s committees mirror those of existing offices within the University administration. This facilitates a broad set of working relationships between member of the TCPW and the University. General support and coordination has remained with the Office of Alumni Relations. When the TCPW was established, those members who were alumnae but not University Trustees were designated Associate Trustees of the University. Those who were not alumnae were invited to serve as honorary members of the TCPW, but without Associate Trustees status. The Associate Trustees status was dropped in 1995. Throughout its history the TCPW has worked consistently to increase the representation of women on University governing bodies, including the Trustees, Boards of Overseers, and other senior leadership positions at Penn. TCPW has also committed itself to funding faculty chairs for women, making direct appeals to its own membership and cultivating the interest of others. TCPW has also participated actively in the University’s general fund-raising programs. TCPW has assisted in the evaluation and admission to Penn of promising high school students; has provided much-needed financial aid to qualified women students; and offers career counseling to students entering the work place. The TCPW has developed a series of regularly-scheduled programs, which include the Career Dinner, annual Spring and Fall Conferences, Faculty Tea, and sponsorship of events on various topics related to the promotion of women’s interest. 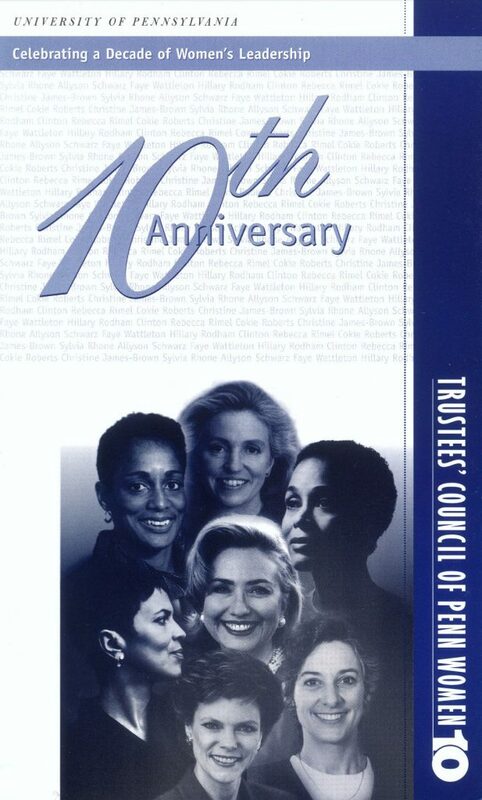 This collection documents the activities and internal organization of the Trustees Council of Penn Women from its creation in 1987 through 2001. The collection includes files on Council membership and chair selection, minutes and correspondence of both the Steering / Executive Committee and the standing committees, meeting files and information packets related to the Council’s annual Spring and Fall Conferences, files of programs such as Career Dinner, Faculty Tea, Alumni Weekend, Tenth Anniversary celebration, etc., files concerning the publishing of the Council newsletter Communique, files of fund-raising activities, files of grants and awards sponsored by the Council, general administrative correspondence, and financial records. The collection also includes non-manuscript material – two floppy disks, three videotapes, and a Wedgwood plate issued by the University in commemoration of its 200th anniversary. The addition charts the planning of the 125 Years of Women at Penn celebration, a two-day event organized by the TCPW to honor 125 years of women attending the University of Pennsylvania. The bulk of the material pertains to the research on the women with Penn connections who were highlighted in the book created especially for the event called Franklin’s Daughters. There are files of the group’s research on the women, correspondence between the event organizers and the people who helped them research. There are files for each of the women as well containing biographical material for each of them. It should be noted that the TCPW utilized the help of other archival repositories while conduction their research. Not all of the highlighted women were Penn alumnae, so often times the TCPW contacted the institution that held the papers of the particular woman there were researching. Therefore, the files on the individual women contain photocopies of original primary documents that were obtained from other repositories. Also included in the collection are approximately 200 photographs taken during the celebration. The photos cover things like the Trustees Dinner, bridge dedication ceremony, and the topical panels with guest speakers. Also included was a tote bag which was given as a gift to either the participants or attendants or both. The tote included a t-shirt, pins, notepad, and a magnet. Second meeting, 1987 Oct. 9, minutes, etc. University logo (coat of arms), n.d.
VHS cassettes (2)-Alvin Shoemaker Reception and Luncheon, n.d.
Alexander, Sadie Tanner Mossell (1898-1989), 1950-2001, n.d.
Asbury, Ida Elizabeth Bowser (1870-1955), 1926-2001, n.d.
Brown, Denise Scott (b. 1931), 1981-2001, n.d.
Brownlee, Rebecca Jean (1911-1995), 1995-2001, n.d.
Flanigan, Anne Lockhart (1852-1928), 1905-2001, n.d.
Gannett, Mary Thorn Lewis, (1854-1952) 1952-2001, n.d.
Gregory, Emily Lovira (1841-1897), 1897-2001, n.d.
Hottel, Althea Kratz (1907-2000), 2001, n.d.
Kilgore, Carrie Burnham (1838-1909), 1997-2001, n.d.
Knauer, Virginia Harrington (1915-2011), 2001, n.d.
Lindsay, Anna Robertson Brown (1864-1948), 1892-2001, n.d.
Paul, Alice (1885-1977), 1909-2001, n.d.
Pennington, Mary Engle (1872-1952), 1953-2001, n.d.
Scott, Jesse (b. circa 1915), 2001, n.d.